In my upcoming book Branded Interactions – Designing Digital Brand Touchpoints Digitale Markenerlebnisse planen und gestalten I will introduce the five „D“s of the Branded Interaction Design (BIxD) process. The BIxD framework we use at think moto allows for an agile yet coherent design development. 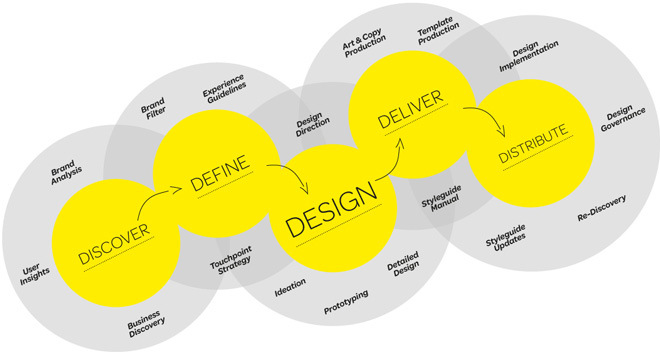 The process combines brand strategy with a human centered design approach. So large parts of the process should be familar to UX professionals and design thinkers, other methods will be known to brand consultants and corporate designers. 1 WE DISCOVER THE OPPORTUNITIES. By conducting stakeholder-workshops and focus group interviews we learn to understand your business and your brand. We analyse your customers’ life styles and behaviour and identify segments in respect of the relevant touchpoints. Personas and customer journeys help us uncover requirements and develop future scenarios for products and services. 2 WE DEFINE THE DIRECTION. In a second step we create the strategy. We find the opportunity space for your brand or product, develop a target position in its market and prepare the ingredients for telling its story. We define brand interaction principles and performance indicators as checkpoints for the later design and development. Insights and requirements are transformed into a strategic road map, which sets the scope for the project. Together with our client we evaluate and prioritise work packages. 3 WE DESIGN THE FRAMEWORK. Now it is all about ideation and imagination. We explore ideas for interaction and visual expression of the brand or product, based on the brand interaction principles. We create the look and feel as well as its design vocabulary. We craft the information architecture of an application. First paper and software prototyping is done for usability testing and feasibility checks. We provide test scenarios and user stories for service providers involved with testing and development. The Design Direction presentation is a major mile stone in our process and requires client approval. 4 WE DELIVER THE DETAILS. Once we have a solid design framework we work out the concept and layout details. We produce copy, photography, motion design and sound as needed. Depending on the project we cooperate in agile or linear workflows with the respective technical service provider. Templates and design elements will be iteratively worked out in detail and carefully documented. 5 WE DISTRIBUTE THE VISION BEHIND. We create styleguide manuals, prototypes, video how-to’s and presentations for you and help you communicate the brand or product vision to executives or employees, sponsors or customers. We assure quality during implementation of digital brand identities, products or services and work with you to set up a roadmap for the further evolution of the project. Branded Interactions will be published by Birkhäuser in October 2011 Hermann Schmidt Verlag Mainz in November 2012. More info about the book and about Branded Interaction Design will follow here soon. Edit (08th Nov 2012): Due to Birkhäusers bankruptcy earlier this year, the book is now published by the great German design publisher Hermann Schmidt Verlag Mainz. The book can now be ordered at brandedinteractions.de (German only).